Monday 4 Lieut Mayer called at my quarters as we were ready to start, and desired my canteen, to get whiskey in, he did not get it and went off telling Frank that he would go by express, this was the last I saw of him today. He did not obtain my permission to absent himself. Our regiment was in front today, had very fine marching. Saw some good plantations on our road, came into the Camp of the 11th 13th 15th & 16th Iowa Reg’s, with whom we had an excellent time, the “boys” were very glad to see each other. Saw about 500 rebel prisoners, who were taken at Port Givson, near Grand Gulf. Travelled about 15 miles, we were glad to get into Camp tonight. Tuesday 5. My Company and Company “I” acted as rear guard of our division, had a splendid time were under the charge of major O’Connor. 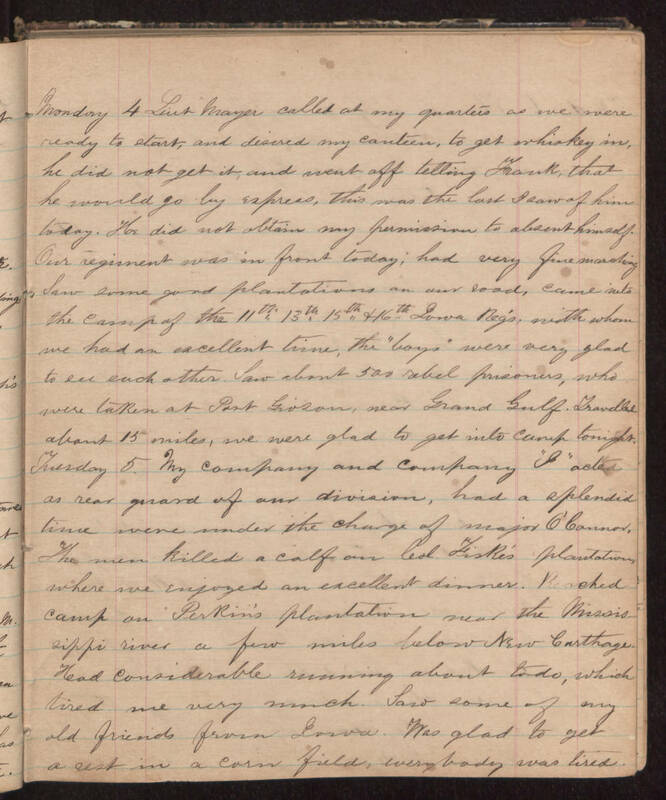 The men killed a calf on Col. Fiske’s plantation, where we enjoyed an excellent dinner. Reached camp on Perkin’s plantation near the Mississippi river a few miles below New Carthage. Had considerable running about to do, which tired me very much. Saw some of my old friends from Iowa. Was glad to get a rest in a corn field, every body was tired.